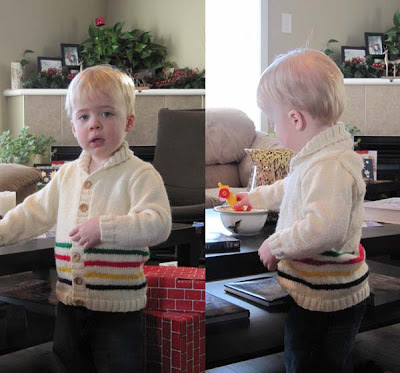 It's so hard to coral an almost-2-year-old and get him to (1) stand still, (2) show off a sweater so that you can see all the angles and (3) smile all at the same time! This completes my list of Christmas projects for 2011. Pattern: I used a shawl collar sweater pattern from Sirdar as the template and added the signature stripes of the Hudson Bay Company, a Canadian institution. The entire body of the sweater was done in stocking stitch instead of with the double moss stitch on the top part. I added 6 little wooden buttons. That's adorable! What a cutie, and a handsome gift from a loving Grandmother. That is exactly what I want to make, but in crochet. I still haven't found the right pattern yet. Nice work!